On NBC’s Crisis, Ballard High School is the premier educational institution for Washington D.C.’s elite children. Among them is the first son, whose protective detail includes Agent Marcus Finley (played by Lance Gross). Today they are headed out on a field trip, but things will not go as planned. An unexpected traffic stop turns into a shoot out in which Lance Gross’s Agent Finley is shot and the students are kidnapped. Luckily, the agent is able to get away with one of the kids in tow. And that’s when the story really gets complicated. If nothing else, Crisis doesn’t waste time getting to the good stuff. Within the first few minutes, it goes from simple character friction to a massive plot, obviously painstakingly planned. And while mystery/thrillers like this aren’t new to television, I can’t think of any project that has used kidnapping on such a large-scale in a conspiracy plot. And aside from the shootouts and cool drone sequences, there is plenty of character driven drama to keep things interesting. There’s the estranged father looking for his daughter’s acceptance. The teenage class president who has been having some sort o relationship with a teacher. And not to be missed, is the familial tension between the two female leads, Agent Susie Dunn (played by Rachael Taylor) and Meg Fitch (played by Gillian Anderson). That subtle subtext is necessary to keep a show like this fresh, interesting, and relevant. There is strong acting from adults and teens alike (I only count one time I gave the teenage acting eye-roll) and the thoughtful musical score bolsters the story instead of distracting. But most importantly, Crisis keeps you guessing. You can’t tell who the good guys or bad guys are, and the man who seems to be the villain is someone you easily empathize with. I’m not sure what the budget was for this pilot, but I could definitely see where there was some cutting of corners. Most blatant was the driving scenes in the beginning of the episode. The effects used to make it seem as if the actors were actually driving was on par with the 50’s. Seriously. Projecting an image on a screen behind a car doesn’t cut it anymore. It looks cheap and distracts the viewer. There are a lot of moving parts here. And while the show handles the multiple storylines and relationships pretty well, that does make it difficult to connect with individual characters. The show is incredibly fast-paced, and if you weren’t paying close attention or momentarily averted your eyes, you could have missed an important detail. In time that will pass, but NBC needs to make sure it hooks viewers and keeps them or the long haul. In this case, the good definitely outweighs the bad. Provided NBC can muster the viewership to keep it on air, Crisis stands to weave an intricate, intriguing story. The challenge ahead to is to keep up the intrigue, twists, and turns that made this pilot so riveting. For a TV aficionado like myself, I can usually see every plot twist and writer’s decision coming. Oftentimes, these things are choreographed to appeal to the less savvy TV watcher. But Crisis threw some things my way throughout the entire episode that I did not foresee. I won’t spoil them here in case you haven’t seen the show, but I gasped audibly a couple of times. There are a lot of layers to be pulled back with each of these characters, and the unearthing their past and motivations is something I can’t wait to see. In case you missed it, stream the premiere below. 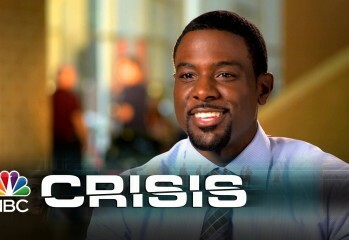 Did you get hooked on Crisis? Share your thoughts in comments section below!